Line a baking tin with baking paper. I used a 17cms x 28cms slice tin. Cream together the butter, caster sugar and brown sugar in a large mixing bowl. Add the egg and vanilla essence and mix until combined. Sift the plain flour, baking soda, cornflour and salt into the butter mixture and mix until it comes together. Then add the choc chips and mix. Once all combined, add the cookie mixture to the baking tin. Spread it out evenly while pressing it gently into the tin. Bake in the oven for 16 to 18 minutes, until golden brown on top. 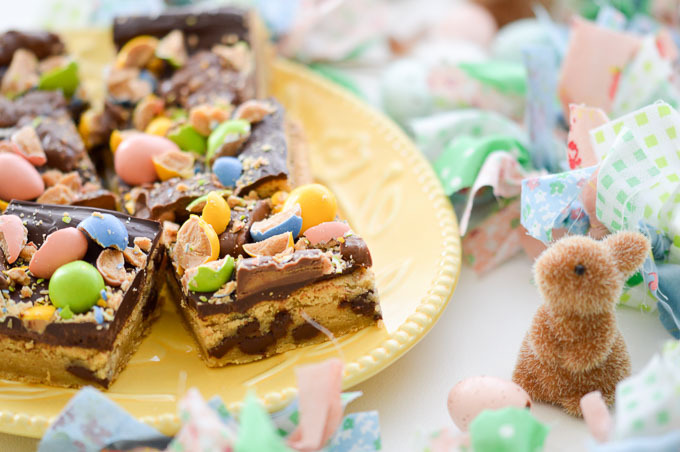 Once cooled you can decorate with the melted chocolate and eggs. Melt the 250gms of chocolate as per directions on the packet. I melted mine on low in the microwave. Remove the cookie slice from the tin and place on a cake rack. Pour on top the melted chocolate and spread evenly over the top. Then you can add your Easter chocolates and have fun decorating. Leave the decorated slice for about an hour until the chocolate on top has hardened. Once set you can slice as many pieces as you want!